We've got Lucky Phil opening up Sugarcane Skateboards, downstairs at the Time Machine. To help him celebrate his new venture, we've got a bloody huge day planned. BBQ - Meat supplied from Queen Street Meats, Vegetarian options supplied by Gunnawanna Foods. Sticker Slap Wall Ride comp. Giveaways and general fun times. 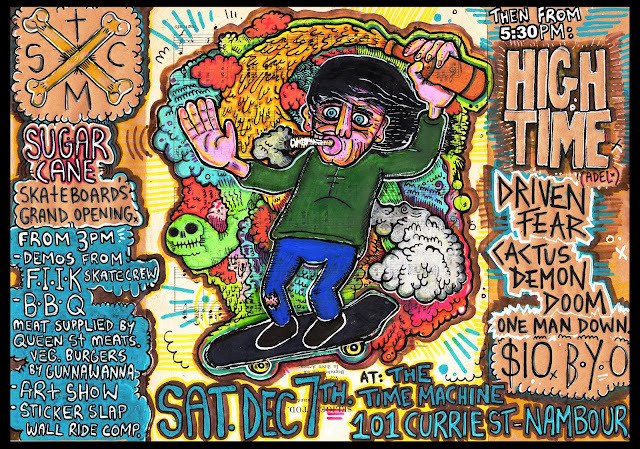 The celebration continues with the mighty Hightime coming back to play. Supports from Driven Fear, One Man Down and Cactus Demon Doom. Once it hits 12pm it'll be Lucky Phil's Birthday, so beeeeeeers. Megadeth - So Far, So Good, So What! Last Lazy Sunday of the year. Festivus, for the rest of us!